A perenial of creeping habit – the herb growing to a height of 30cm with flower spikes during the flowering season (July, August) to 45cm. Both the flower and upper parts of the green herb contain an essential oil which gives the plant its characteristic odour. The foliage is of a dark green sometimes greyish colour with a much branched ‘feathery’ appearence. The flowers are characterised by their flattened corolla which is easily disinguished from the dome shaped corrolla of Matricaria (below). The herb itself has a history of use stretching back to the Ancient Egyptian and Moorish Civilisations and it has certainly been grown in England for over a thousand years, being one of the Saxons’ nine sacred herbs – known as “Maythen”. It is not surprising, therefore, that it should be known as “English Chamomile” being ideally suited to our climate and soils. The flower heads are harvested when they are in full bloom in July and August and the Essential Oil is extracted by Steam distillation. The Oil is a sky blue colour when first distilled with a clean, almost medicinal but floral aroma. The sky blue is caused by the presence of traces of chamazulene, a powerful antiinflamatory agent. The Oil is widely used in Aromatherapy for its soothing properties and its ability to blend happily with other oils, and more generally in cosmetic and skincare preparations. During the distillation process, the ‘water’ fraction of the distillate, containing many of the water soluable fractions of the essential oil (Known as the Hydrolat or Floral Water) is collected. This Hydrolat has many of the ‘virtues’ of the herb and essential oil in a water soluable form, and finds many uses in water-based cosmetic products from skin toners and conditioners to soaps and shampoos. On its own, as a pure hydrolat it has a surprising warm honey-like aroma and can be used as a skin cleanser and toner in its own right. When grown in England on our rich Fenland soils and steam distilled, this plant produces a beautiful green/blue oil with a very distinctive rich herbaceous aroma reminiscent of the delicate rather cooling almost ‘buttery’ aroma of the flower, but much enhanced. The herb itself has a history dating back to Achilles (hence the name) who is reputed to have used it for wound healing, a reputation it has preserved through the centuries. Like its close relatives the Chamomiles (above), Yarrow is used in cosmetic preparations and skincare. The English Yarrow blends particularly well with other oils in Aromatherapy being less viscous and ‘dark’ than imported oils. 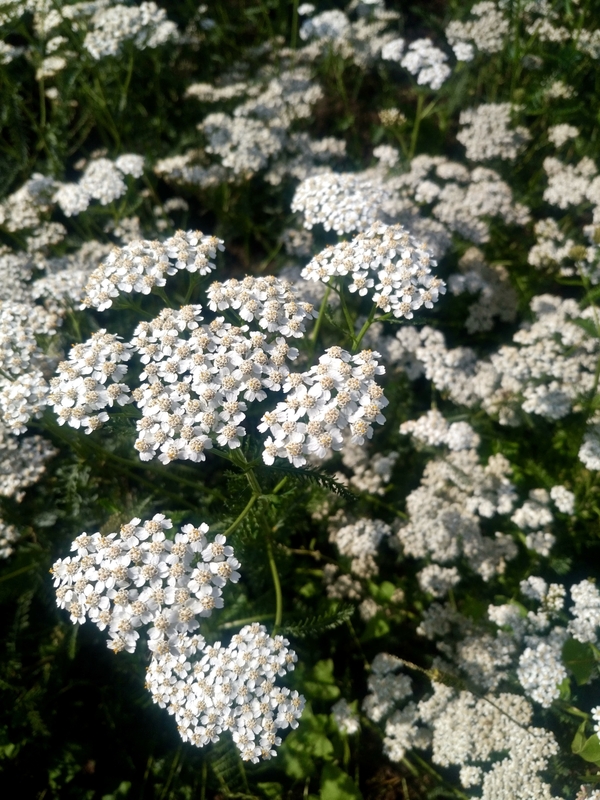 Yarrow also produces an excellent Hydrolat during the distillation process ideal for use in hair preparations and other skin care products. 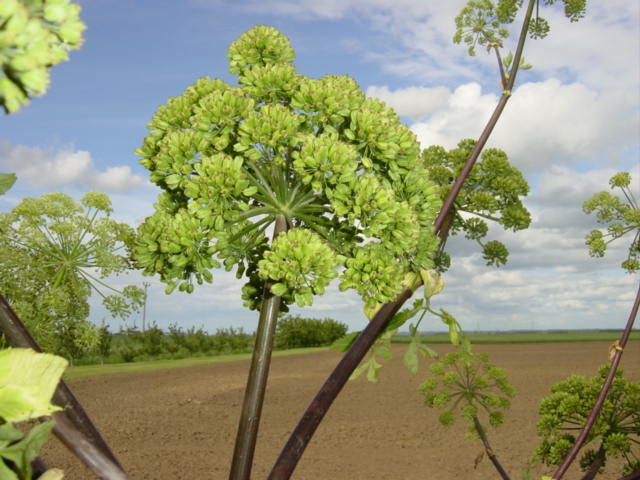 Angelica is a bi-ennial plant, which flowers in its second year and can grow to a height in excess of 8 feet on our fertile fen soils. 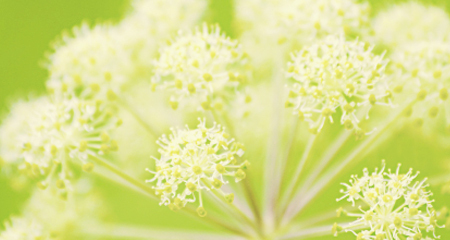 Norfolk Essential Oils are the largest producer of Angelica Root and Seed oil in the UK having pioneered the techniques used to extract the oils from this eye-catching plant. Growing on the rich fenland soil has produced an oil of exceptional quality. The roots and seeds are both steam distilled in order to extract the oils after careful drying. The resultant oils, root oil pale yellow & seed oil colourless to pale yellow have a very rich and powerful odour, which is very characteristic of the plant. It is used in the food and flavour industry as well as the perfume and fragrance industry and in aromatherapy it has been used to help with mental clarity, to improve digestion, relieve aches and pains and its vapours help with colds. An annual of a more erect habit than Anthemis growing to a height of 60cm or more and with somewhat sparser but similar feathery foliage. The green herb of Matricaria has an odour similar to, but somewhat sweeter and ‘apple-like’ than the more astringent Anthemis. The extracted essential oil however, is very different. The flowers are harvested in June and September and steam distilled for for many hours. Matricaria oil is inky blue and somewhat viscous with a rather green almost pungent ‘grassy’ aroma. The dark blue is caused by the presence of a high concentation of chamazulene in this oil and it is for the antiianflamatory properties of this substance that the Matricaria chamomile is most prized. In many other respects the oil tends to be used for the same purposes as Anthemis nobilis although its high price tends to encourage its use as an ingredient in skin care preparations rather than a ‘stand alone’ aromatherapy oil. Mitcham mint has been introduced into the Norfolk fens by the company to supply the industry with a superior quality peppermint oil. The perennial herb thrives in the silt fen soils and after planting soon spreads to form a carpet of mint leaves across the fields. The carpet of leaves are cut when the quality of oil is assessed to be at its best and allowed to sap dry before steam distillation. The oil is of excellent quality and expansion of the growing area is still ongoing. This excellent sample of peppermint is very popular with our aromatherapy customers. The oil is widely used as a flavour ingredient in foods, pharmaceuticals and drinks and as a fragrance in perfumery & toiletries. It has several uses in aromatherapy and is widely known as an aid to an upset stomach. The Hyssop and Clay Sage were first distilled in 2000 and following their successful launch into the market the acres of these are increasing to meet with their increased demand. Other oils being grown by the company are constantly being evaluated for their quality and suitability for growth within the company and are available to those customers looking for these UK distilled oils. We are able to grow under contact for those customers that require oils grown for their own specific use with the assurance and knowledge of the complete crop history and high quality of production. Crop areas of any size can be contracted to any size of customer, please contact us for further details.